Telus International - PROJECT - FOSHAN LEADEX FURNITURE CO.,LTD. Telus wants to create a work environment that has work/life balance at its core. That’s why Telus often remodel and expand our facilities to accommodate our ongoing growth. Address：Torre TELUS Pradera: 18 calle 25-86 Zona 10. Guatemala. Company introduction: As the global arm of TELUS – a leading Canadian telecommunications company with over $12.5 billion of annual revenue and almost 12.5 million customer connections – TELUS International employs over 20,000 people with delivery centers in eight countries serving customers in over 30 languages. TELUS International Central America offers geographic diversity, multilingual programs, integrated multi-channel services, solid IT infrastructure and a strong focus on customer service. Demand Spot: Telus’s workspaces are designed to engage the whole person and reflect their clients’ brands. Telus wants to create a work environment that has work/life balance at its core. That’s why Telus often remodel and expand our facilities to accommodate our ongoing growth. Talents are the most important fortune. People’s emotion are affected by working environment. A good organized working space promotes physical and mental health, helps people respecting their work, increasing efficiency. As the largest Business Process Outsourcing (BPO) provider in Central America, Telus is with almost 7,000 team members. For Leadex, the first point to be considered is how to accommodate as many as staff comfortable in limited space. And our designer communicated with Telus adequately, understanding their company culture, organization and staff demand. Then we give suggestion how to plan the layout. These are initial plans offered by Telus. From that, Leadex has a rough idea what they want. According to customer’s information, Leadex’s designer provided CAD layouts for floor 6, 7, 8, showed the layouts clearly. From investigation, Leadex finds out that Telus’s employees were fixed into closed workstations, repeated the jobs every days, team members less of communication. Leadex knows must build a good setup to encourage communication, increasing team spirit, enthusiasm and efficiency. 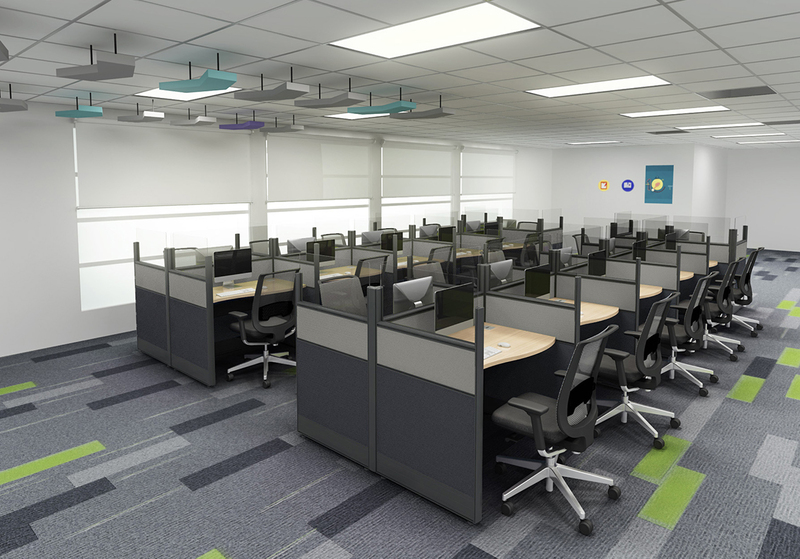 *Leadex provides high quality 3D rendering pictures to show the size, color scheme, configuration.,etc. Leadex design a frameless added-on glass for Telus specially. With clear glass’s open vision, people are no more working in a closed box. In the new setups, Npeople have good balance with the privacy and communication, unofficial communication are increasing, people’s working model and thinking model are changing, people are more active. As a technology company, Telus pays attention to data access and technology equipment using. So they need a good wires running plan. According to this point, Leadex’s designer provides many suggestion and confirms the wires running plan finally. *These are drawings provided by customer. * Leadex provides 3D drawings, make it easy to understand. Leadex provides 3 colors schemes for options. And Telus finally chosen the scheme deep grey plus light grey. *Color and atmosphere effect on people’s emotion and reflect company culture. Leadex will provide a few color plans for options. “Feel good. It’s different here. Leadex not only provides a total new working space, but also a new communication model and working model. This new space inspires talents’ working enthusiasm and potentiality, makes the team more competitive.